Abstract; On May 15, the 9th meeting of 750th Anniversary Committee was held for the last time. The members consisted of the priests and believers adopted the report of the commemoration settlement, including the domestic and overseas ceremonies, the service of the Head Temple, the Hoando construction, and publications in Japanese and in English. Finally, the president of the committee, the 67th high priest Nikken-shonin, declared the dissolve of the committee finished all of the functions successfully. Abstract; On May 21 and 22, the 1st domestic Hokkeko Summer Lecture Tozan started. This tozan has been scheduled at ten weekends, overnight-stay of Saturdays and Sundays. 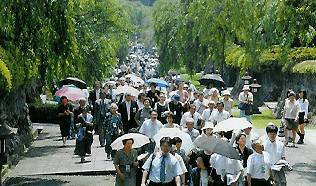 In this year, three lectures are given by the priests on Saturday about a Go-sho for Nanjyo Tokimitsu (40 min. ), the life story of Nanjyo Tokimitsu (40 min. ), and the importance of shakubuku (40 min.). 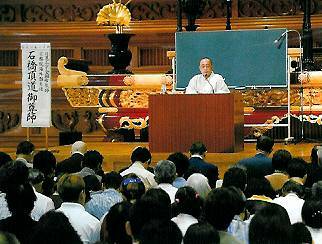 On Sunday, "Rissho-Ankoku-Ron" is lectured by the High Priest (90 min.). 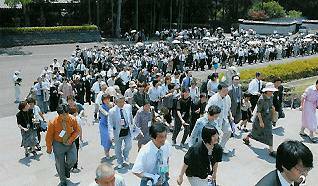 "The 1st" means the new start for the 750 anniversary of "Rissho-Ankoku-Ron" in 2009. Around 5,000 believers will attend per weekend.